Last edited by Victoria on Tue Jun 28, 2016 3:25 pm, edited 1 time in total. Greetings again Isildilmë, can you translate this in Tengwar Annatar Italic (TA-I)? Btw: 4 years ago you translated my first sons name and date and I got a tattoo of it, it was beautiful! Par contre, il ne s'agit pas de Quenya sur toute la ligne. Ánin apsenë l'est (et est d'ailleurs sans faute), mais le reste me semble être du Sindarin. Puisque j'ai trouvé la même phrase sur de nombreuses pages web, il est probable qu'elle ne contienne pas d'erreurs, mais je recommanderais quand même de demander l'avis/le feu vert de Xandarien dans la section Sindarin des forums. 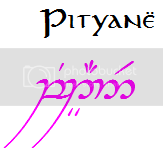 Tout dépendant de ce que tu recherches, peut-être aimerais-tu aussi que tout soit soi en Quenya ou en Sindarin, au lieu d'un mélange des deux. C'est toi qui voit! 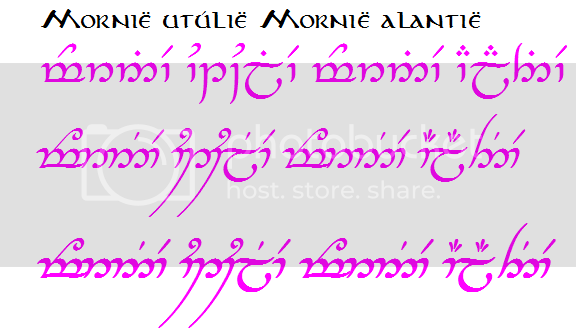 Si tu optes pour tout avoir en Quenya, tu peux volontiers me faire une demande ici, et même chose pour le Sindarin dont Xandarien s'occupe. Your request contains almost all necessary information, thank you. Could you please also tell Isildilmë what language you'd like "Johan" to be considered as? Hi Gladhaniel! As for Language, i'm norwegian so I guess norwegian! But if u can do it in English also I would be greatful! Thank you! Non je pense que cette phrase me convient et puis je commence à m'habituer aux consonances Merci d'avoir effectué des vérifications c'est très gentil ! Sidd ! I’m so happy you poped in ! I emailed you a few days ago. I hope you are fine my friend ! kiwiwin365 : no problem ! 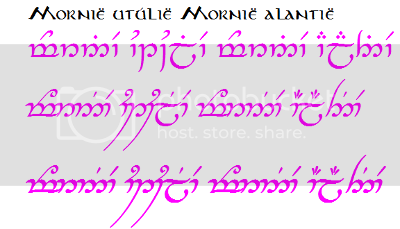 marijamarija123 : As Alma said, if you want the sentence to be in an elvish language (translated), you have to post it first in the Sindarin or Quenya thread. Here I do transcription, so I convert the roman letters for tengwar. See the introduction post (link in my signature) for more details and links. You’ll also see there the list of the available fonts. If you just want the English sentence written in Tengwar, then it’s a transcription and I can do it directly. Just tell me what you prefer. About the two links you found, I have to say that I disagree with the transcription on the tattoo of the picture… many transcription modes exist and we cannot always tell which one is better as Tolkien himself explored many modes. But I really disagree with that one. And the font too, because this font (called Tengwar-Gandalf) is an incomplete font, so the person chose tengwa which were similar to the one needed when they were not available, but the meaning is not the same ! The second link leads to an automatic transcriber… and even if automatic transcribers on the net can give an idea of what the transcription can look like, it’s never like a human brain and I usually find errors in the transcriptions that they provide. ruzwildfire : He is fine thank you ! He’s just a bit harsh as a boss ! Perica : I guess that the correction you made on your post on April 17th are made with the official changes you made with Dhani, so now it’s final ? That is how I consider it. And your request is complete . And thank you, my sons are fine, even if the youngest is in a rough part of life with stomach hurting, colics, etc. Should be soon over… and with a bit of chance he’ll decide to let his mom sleep a bit too ! stanleyfan777 : Haha ! thank you, but now I’m curious to see what your transcriptions look like ! I have what I need and there is no problem with the fact that they can be similar. As I work on a computer, in the worst of case I can do a “copy-paste” and change the details ! And don’t worry, almost everybody here is a newb ! 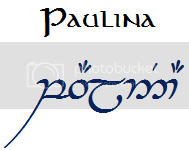 Isildilmë wrote: Perica : I guess that the correction you made on your post on April 17th are made with the official changes you made with Dhani, so now it’s final ? That is how I consider it. And your request is complete . And thank you, my sons are fine, even if the youngest is in a rough part of life with stomach hurting, colics, etc. Should be soon over… and with a bit of chance he’ll decide to let his mom sleep a bit too ! You helped me 8 yrs ago, when I wanted to make a tatto with the name of my little daughter. Can you please also give Isildilmë the following information? Hi again! Thank you for fast answer! HI, I'm hoping you can translate these 3 for me, I want to put them on my service dog's new leather harness. "never laugh at live dragons"
"It's a dangerous business, going out your front door"
"all we have to decide is what to do with the time that is given us"
"it is not the strength of the body that counts, but the strength of the spirit"
"even the smallest person can change the course of history"
I am hoping you would be able to transcribe a phrase for me for a tattoo I want to get. Anyway, Xandarien was kind enough to translate "First love yourself" to Sindarin for me. Thanks again, this is a kind thing you do and it is really appreciated. Hope everything is going well with your new baby. Could you please transcribe the English word Family for me in TA-I and TA-I+B? I wasn't sure if you were still taking transcription requests but I thought I'd try anyway because I'm really hoping to get a tattoo soon! First I just wanted to say how much I admire your dedication and your helpfulness to all these Internet strangers! I've read through each thread and you're just simply awesome!!! I know there's quite a bit here and I don't really know your process or quite how long it takes you (or if you are able to do these), but I think the most important ones for right now would be "Wit beyond measure" , "Vir dirthera" , and "Banal nadas"
Thank you so much!! It means so much to me! Thank you so much for your previous transcription! I hope you are able to help me with some others? Thank you very much in advance! For everything. I'm new here but I'm loving what youre doing. Can you please also tell Isildilmë what language that name is? Thank you! Per my post in the Quenya thread all I need is to confirm the Tengwar for Nenya (which is one of the ring's of power; Galadriel's ring). In this case, I need the tengwar script literally by the end of the afternnon (Los Angeles, pacific time) today as the designer for the ring threw me a curveball and my 2 week deadline just turned into 24 hours due to complications with engraving. If you could provide the tengwar script I would be beyond grateful and, as I keep offering (like a bit of a jackass), I'll be happy to provide reasonable compensation (via paypal) for what is an absurdly quick request. Last edited by fang13 on Fri Nov 25, 2016 10:31 pm, edited 1 time in total. I know it is a lot of work and I seriously appreciate every second of your time that you invest in the Transcription! Thank you so much! I would like to ask which online program is the best for english - tengwar transcription? I've tried these two and there are quite a big differences! I was looking for a sentence: "May all stars shine upon your path"
3. I hope that the memory of our friendship will be everlasting. Last edited by enrai on Fri Oct 07, 2016 9:53 am, edited 1 time in total. Oof ! This summer has been a never-ending race, with family vacations and everything... I have to admit that I was a bit afraid to come back here, worrying about the possibility to discover that there were 3 whole pages of new requests. Good news, there are not ! I'll work on a few requests tonight, and probably tomorrow.